We've always felt that an owners manual should provide more than just assembly instructions and identify the controls. It should provide dimensions and specifications, thoroughly cover operation of the machine, and explain the accessories. LPL makes terrific enlargers, but the manual supplied by the factory leaves a lot to be desired. 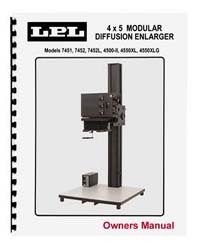 So, we've taken the factory manual and reformatted, reorganized, rewritten, and added a significant amount of additional material to make this a far more helpful and useful reference for your enlarger. This deluxe manual features a comb binding so it will lie flat for easy reference, front and back covers on heavy cover stock, and a clear plastic cover page for added protection and durability. 8½" x 11" format. Comb bound. 15 pages.